Life to the Full Book Club. Join other young adults (20’s & 30’s) each week to meditate, share and discuss life, faith, purpose & how to live life to the full. Ewe Thina: We Walk God’s Way. Want to get fit? Embrace God in nature and build true friendships? Catholic Young Adult Conference: The Tine Network is partnering with Net Ministries to host a conference on Catholic Youth Ministry in Ireland. SUNDAY 4th June Celebrations at the Church of the Sacred Heart to close the 150th Year Events 10:30am FAMILY MASS 12:00noon MASS CELEBRATION WITH CHOIR Parish Community Fun Day in the Church grounds following the 12noon Mass Entertainment – Music Singers (Harmony Knights) Clown Face Painters, Tented/Gazebo Area and Refreshments! We probably don’t realise, cannot realise how much our Lord suffered for us. And certainly we don’t think about it enough. In order to understand it, I think we have to try and imagine what it was like. Mirror of Pain, is a musical composition for the organ by Hendrik Andriessen of Five Poems by the Belgian Poet, Henri Gheon. The poems describe the sufferings of Jesus Christ, as seen through the eyes of Mary his Mother. The parish organist, Michael Quinn and Soprano, Pauline Graham, will present 'Watch and Pray' on Holy Thursday, 13th April, at 9.00pm. This is a musical reflection on the Passion and Death of Jesus whichinterleaves Scripture Readings of the Seven Last Words with reflections and a seven movement suite for solo organ by Alan Ridout. Each organ piece is a short musical response to the Scripture text. The parish organist, Michael Quinn, will present this will present this on Good Friday, 14th April at 7.30pm. Our prayers are with the families of the crew of Coast Guard Helicopter Rescue 116: Captain Dara Fitzpatrick, Mark Duffy, Ciaran Smith and Paul Ormsby. We pray for fair weather and calm seas to aid the recovery of the bodies of the remaining crew members. Earth Hour will be marked around the world on Saturday 25 March. In Ireland, it will be observed from 8.30pm until 9.30pm. Earth Hour is all about inspiring people to take better care of the planet. 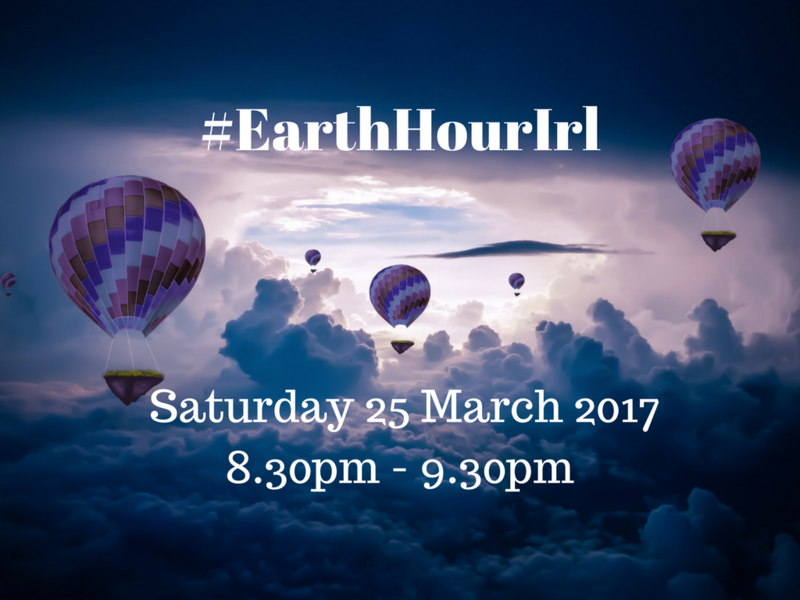 Earth Hour is the single largest symbolic mass participation event in the world. Born of the hope that people could be mobilized to take action on climate change, Earth Hour now inspires a global community of millions of people in 7001 cities and towns across 178 countries to switch off lights for an hour. The event recognizes our global responsibility for the climate change which is already devastating lives and threatening the future of the planet.